I present the shortlist for one of my favourite Coffee Spot Awards, that of “Happiest Staff”. Last year it was won by Café Boscanova and this year’s shortlist is particular strong. I was blessed as I visited numerous places with some very happy staff this year. This is the one award where I could have filled the shortlist multiple times over. In my opinion, staff are probably the most over-looked part of any Coffee Spot. Good staff can make a place and bad staff, no matter how great the coffee and wonderful the location, can kill a place. Everywhere that features in the Coffee Spot has great staff, but these were exceptional, with some infectiously happy staff. There are six Coffee Spots on the shortlist this year, listed in order of publication, although there were so many great places that I’ve included another five “special mentions” at the end. Despite the name, Manchester’s North Tea Power serves some excellent coffee as well as having some of the happiest staff I’ve come across. The tone is set by the owners, Jane and Wayne, but seems infectious across all of the staff, one of who I spied dancing behind the counter in a quieter moment. 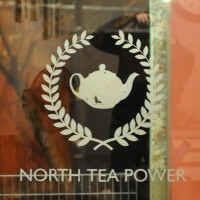 This all rubs off on the overall atmosphere in North Tea Power, helping to make it a wonderful place. I was predisposed to like Café Olimpico in Montréal for a host of reasons, including the excellent coffee and neighbourhood bar feel. However, when the two baristas started singing along to classics such as ELO’s “Don’t Bring Me Down” I was sold. The highlight was their accompanying Sister Sledge singing “Good Times”. Café Olimpico is also shortlisted for the “Best Neighbourhood Coffee Spot” Award. Four Corners opened its doors on Lower Marsh behind London’s Waterloo Station earlier this year. It’s a lovely place, but one of the things that made it stand out for me was the happiness of the staff, something that’s all the more impressive given how little time they’d been open when I visited. The Shrewsbury Coffeehouse is another of those Coffee Spots that could have been shortlisted for any number of awards. 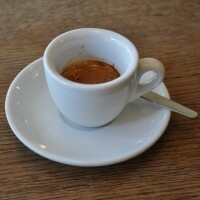 As it is, it’s also in the running for the “Best Espresso” Award. However, the thing that struck me the most was just how happy the staff were. I’d only meant to stop for a bite of lunch and ended up staying for more coffee and a slice of most excellent cake. White Mulberries in St Katherine Dock is generally-speaking one of the happiest places I have been. Owners Peyman and Rana rival North Tea Power’s Wayne and Jane in the happiest owners stakes. White Mulberries is also on the shortlist for the Coffee Spot’s Special Award. A special mention needs to go to the following: Boston Tea Party, Worcester; @the Well on Cheltenham Road, Bristol; Doctor Espresso Caffetteria opposite Putney Bridge Station; Workhouse Coffee, King Street in the heart of Reading and Taylor Street Baristas, Mayfair. And the winner is White Mulberries! You can find all 20 of the 2013 Coffee Spot Awards here.